Erik Nieminen is a painter based in Berlin and Montreal who holds a BFA from the University of Ottawa and MFA from Concordia University. 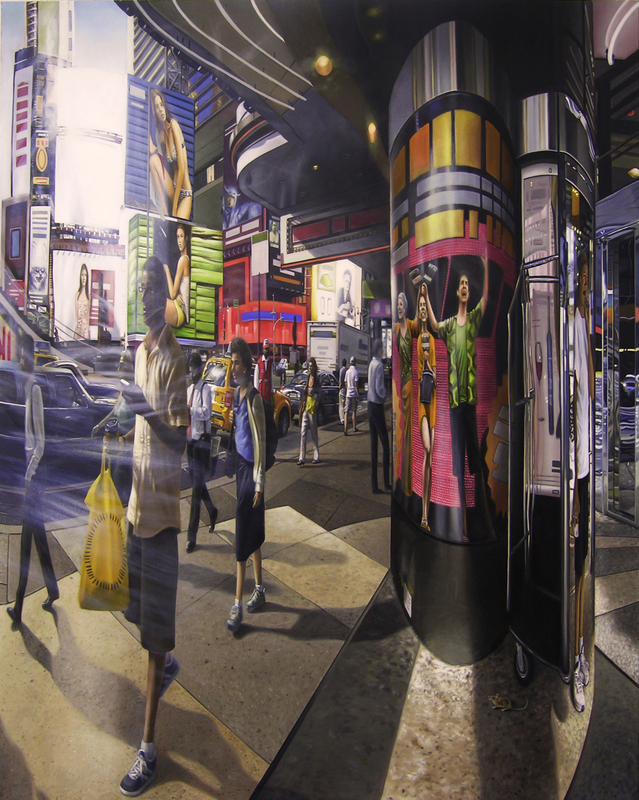 His work focuses largely on human perceptions of reality, particularly within the reflections of urban landscapes. Nieminen’s paintings can also be found online at http://www.eriknieminen.com/. How do you find a subject and begin a painting? I have always been fascinated by large cities. There is a certain dynamism and excitement to life in the city that I think has fascinated artists, writers, composers, filmmakers, etc. since the dawn of the industrial age. I view the city as a kind of construct, a fabrication that is intended to serve humanity in an organic, natural, fluid kind of way. I mean this in the context of it attending to natural human behaviors and tendencies, not in terms of serving a green environment. The city itself is a vast template for meaning, and it is inescapable that we absorb the meanings and intentions of the various images that we encounter throughout the urban fabric. However it is not these particular meanings that would generate a painting, as I do not intend for my paintings to have an outright describable meaning. 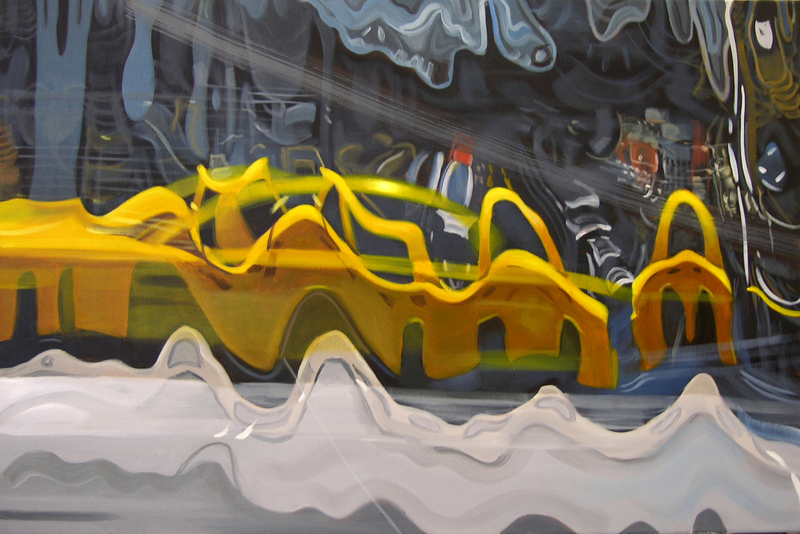 The structure of the painting itself will create the meaning through the orchestration of an experience on the canvas. I take thousands of photographs, documenting my experience of being in an environment. The photographs themselves are merely tools to use on the path to creating the eventual painting. Out of these photos, certain ones will jump out as being useful, but I keep all my photos as, years later, I will sometimes find something in an old photograph that has suddenly become relevant. I will then start to imagine the possibilities in combining these various subjects found in the photographs, and, at a certain point, I have a general idea of what I’m looking for. At this stage, I may begin doing several sketches, usually quite loose but sometimes more detailed, in order to get a firmer sense of the space I will be dealing with. Usually, I will wait at least a couple of months before starting the painting in order to see if what I initially envisioned is still worth doing or if it can be improved upon; it generally can. Then the painting can begin. You mentioned how the “orchestration of an experience on the canvas” develops meaning. To that extent, do you feel that the experiences of your viewers and audiences determine the meanings behind your paintings? To an extent, yes. The viewer will always take something unique from a painting, and, so, I agree that the viewer might determine a meaning for a painting. However, the painting need not rely on this to give it value. Marcel Duchamp once said (I’m paraphrasing) that an artist only has fifty percent of the responsibility, the rest being up to the audience. I do not necessarily agree. The artwork has its own autonomous existence, whether or not the audience places anything on it. The “meaning,” if we can call it that, of the painting is inherent in its structure, in its form, in its very existence. 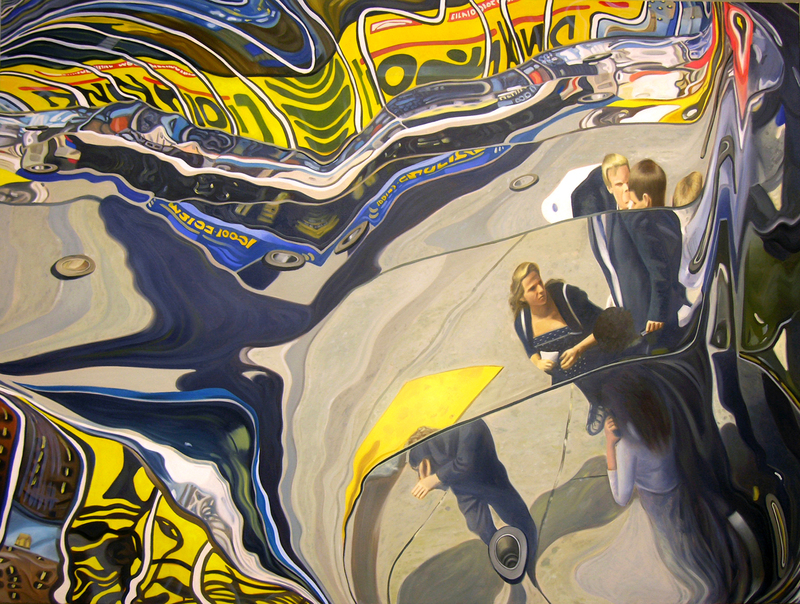 The meaning of the painting is to create a new framework in which to experience what we think we know. To that extent, the meaning lies in the experience of the painting, and, if viewers choose to pull social commentary or political statements out of it, then that is their prerogative. Describe your affinity for reflective surfaces. What do these surfaces represent for you? 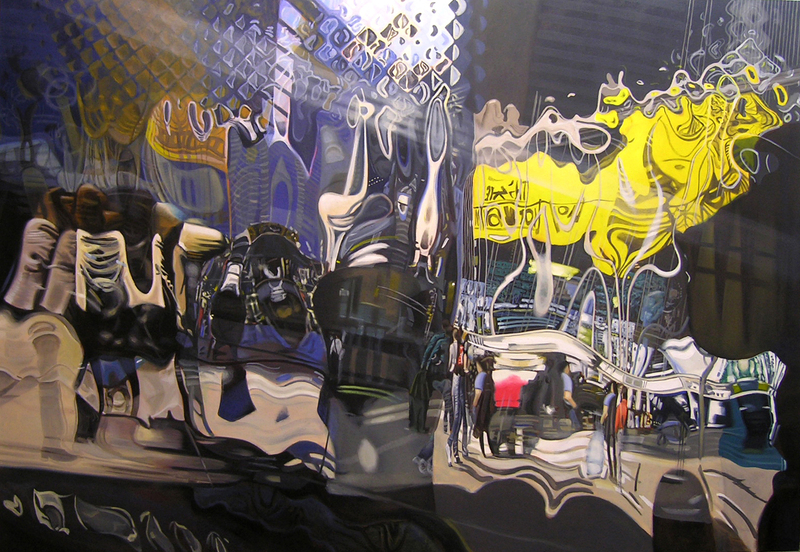 The reflective surface is a crucial component to most of my works. It is also one of the most prominent things that one finds in the modern city. 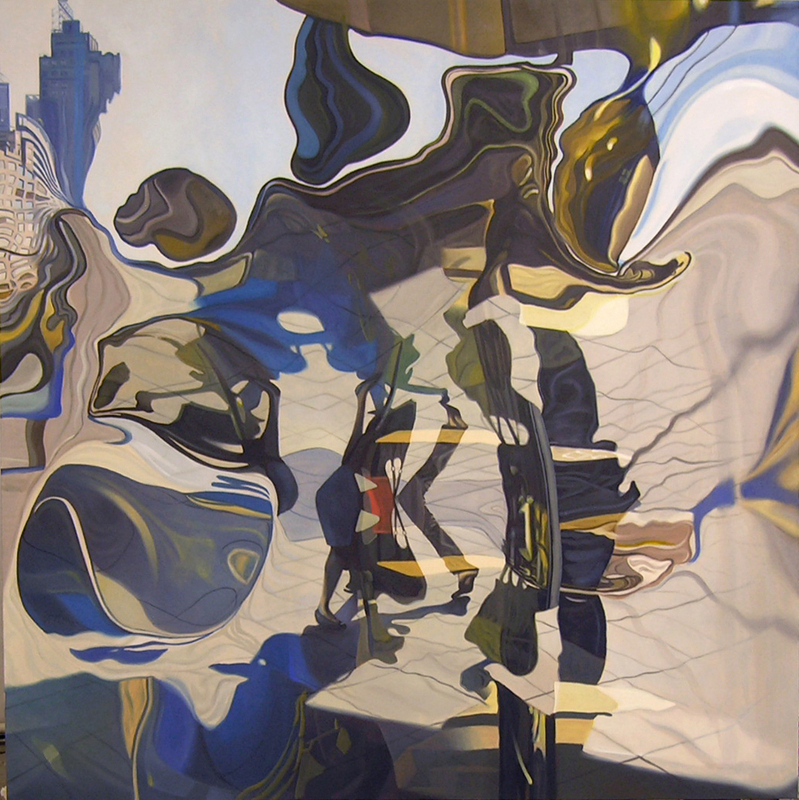 Initially, I gravitated towards the depiction of reflection as a means of depicting the disconnect that one experiences in urban environments. I am fascinated by light, and, for me, it is light that defines form and creates space. A reflection is an ephemeral response to light, but, in a sense, it is disconnected from the gravity of our world. If we allow for the possibility that the reflection is a state of “non-gravity” (light itself does have gravity, in terms of general relativity), then the possibilities that arise from it in terms of making art are basically endless. 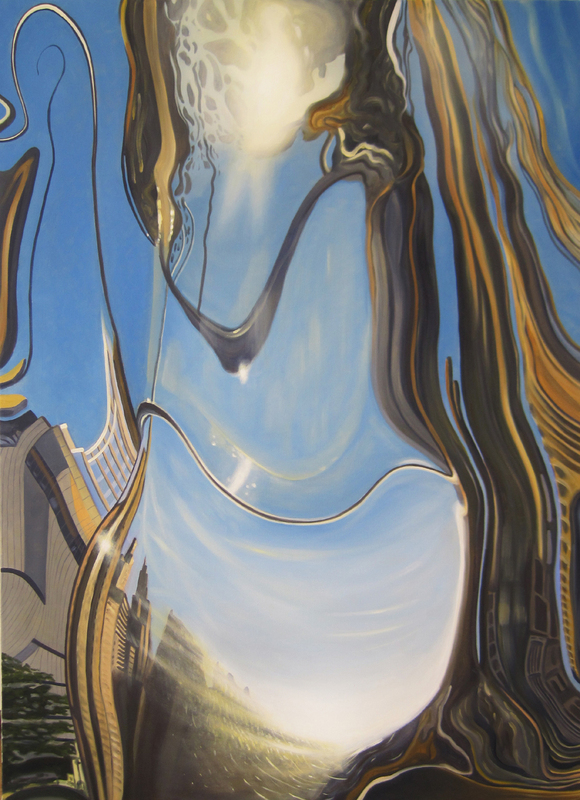 In its sublime materiality, it allows a direct connection to the natural world as the primal state of glass is a liquid, and the reflection as seen through a liquid visually destroys the world we know. Part of my interest is in deconstructing the city and reforming it on my own terms. The glass reflection is a means to this end, as it allows us to see beyond ourselves and to twist and manipulate our vision of what is real, a visual truth, to break the grid of the urban environment. 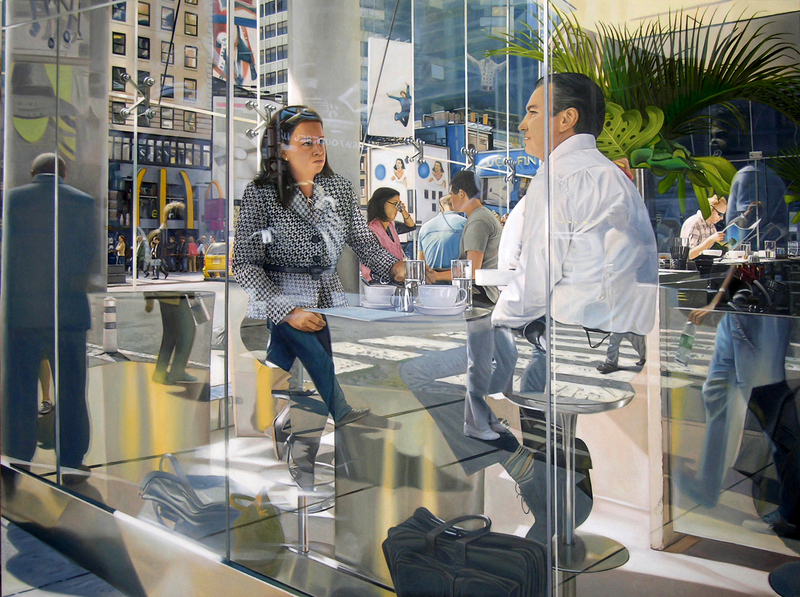 The reflection and it’s primary material, glass, are elements that allow us to escape the mundane world. If art is to present us with an independent state of reality, something that is based on what we know but creates something that is ultimately unknowable, then a subject as rationally slippery as the reflection is one way to go about it. As a realist painter, would you say that your art is more influenced by old masters like Caravaggio (or even Degas) or by more contemporary art movements? Actually, my main influence is modernist painting from the early Twentieth Century such as the works of the Futurists and the Cubists. They posed problems for painting that have not yet been resolved, even though it has often been assumed that Art has moved past that. The masters of old are, of course, important, and really should be important to any painter, even those working in the absolutes of abstraction. In terms of more contemporary movements, for a time I was quite influenced by certain elements of the photorealist painters. It was a way for me to escape the modality of working in a somewhat neo-Futurist stylization or method. I found the best way was to do what would seemingly be the opposite, thus photorealism. Within a couple years, however, I started moving further away from the photoreal aesthetic and began defining the spaces of my paintings more on my own terms. I do not adhere to any particular label, and, thus, I am not a photo- or hyper-real painter, nor am I a realist painter. If anything, I suppose I could be called figurative, but what does that really mean? The lines between figuration and abstraction are blurry, and, for the most part, don’t exist. How do you like the Berlin art scene? The Berlin art scene is very vibrant, but very hard to put into a box, as there is a such a range of art that is always to be seen. A lot of it is quite experimental, as many younger artists come here to try things out because it’s cheaper in Berlin to get started on a project. However, there’s also lots of traditional mediums (painting, sculpture) on show, as well. Between the hundreds of galleries, several museums, or the occasional art fairs, if you want to see art, you always can. Most days of the week, you can find an art opening; however, I don’t go to openings all that often, as the type of socializing that one finds at such events isn’t necessarily something that I enjoy on a regular basis. In any case, for the moment, I enjoy living in a city where art is always in easy access. How did you find yourself interested in painting? Why do you paint rather than create, for instance, photography? I’ve always been interested in painting. My father is an artist who focuses primarily on painting, and there are and have been other artists in the family, as well. I have, thus, been surrounded by painting my whole life, so it was only natural that I might be interested in it or, at the very least, see the importance of it. The wording of the second half of your question is interesting and actually points towards my answer. You asked why I would rather paint than create, for instance, a photograph. The key word here is create, as you “take” a photograph, but you “create” a painting. I am interested in the act of creation. Photographs are interesting in their supposed documentation of reality, although it is debatable whether or not it really does create a document, but it restricts the person using the photographic device due to the structurally mundane nature of a photograph. A painting has the possibility to take on whatever form it wishes, only limited by the capabilities of the artist. The photograph grounds its reality in that of the one in which we live, as it repeats the answers to the questions we know. Painting does the opposite. The use of photographic sources in painting is not necessarily problematic if the photo is used as a tool to manipulate our definition of veracity and to create a new space through painting. 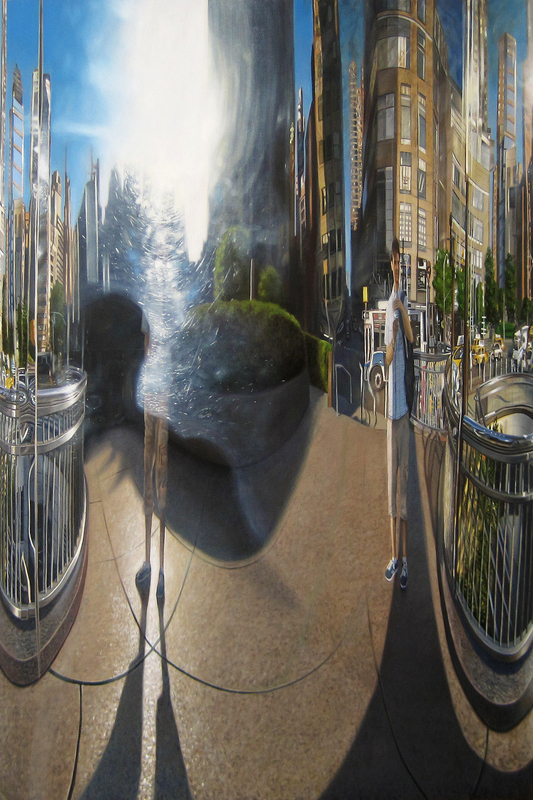 Because photography is so readily accepted as a document of something real, that is what makes it so useful to a painter who can turn the photographic veracity into a painterly de-simulation. As for other mediums, such as sculpture, perhaps I will turn to that at some point. I have many ideas that might function in three dimensions, but I haven’t dug far enough into it yet to warrant doing it. Film is also interesting, as it’s actually closer to painting than photography is, but it’s not anything I want to focus on. Please view Erik Nieminen’s work at http://www.eriknieminen.com/ and “like” Critique Collective on Facebook at http://www.facebook.com/critiquecollective.